After years of rollercoaster-like ups and downs, both in his record and weight, MMA veteran Dennis “Superman” Hallman appears to have finally found his niche. A 20-second submission win at the recent ShoMMA: Strikeforce Challenger Series event over late replacement Justin Davis has given Hallman a five-fight winning streak and reason to believe he could once again be in a title hunt. After cornering Victory Athletics teammate Brad Blackburn at the recent Ultimate Fighter 9 Finale, Hallman spoke to MMAWeekly.com about his win, his year away from fighting, and what’s next. “My opponent got changed at the last minute, so I ended up facing a guy who was a 205-pound striker, and I knew he wouldn’t have a lot of ground and it would be stupid for me to stand with him,” said Hallman of his fight strategy. While Hallman chuckles about how fortunate he was in his last fight, it’s actually the serious business of working on his endurance that has helped him get on such a hot streak. 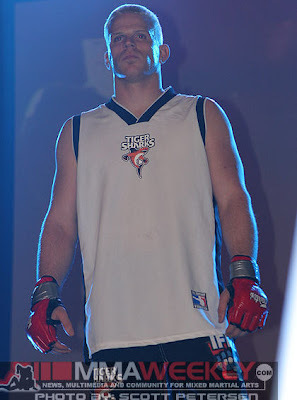 Hallman returned to action this past March after serving an illegal substance related suspension stemming from a November 2007 fight. Having fought for over 10 years, he was asked if he entertained thoughts of possibly leaving the cage for other avenues during his 17-month layoff. “I never really had a thought of stopping,” he responded. “I had a whole team of guys who were fighting the whole time, and my responsibility was to prepare them for their fights; just make sure they were ready to win, and at the same time keep myself in shape.